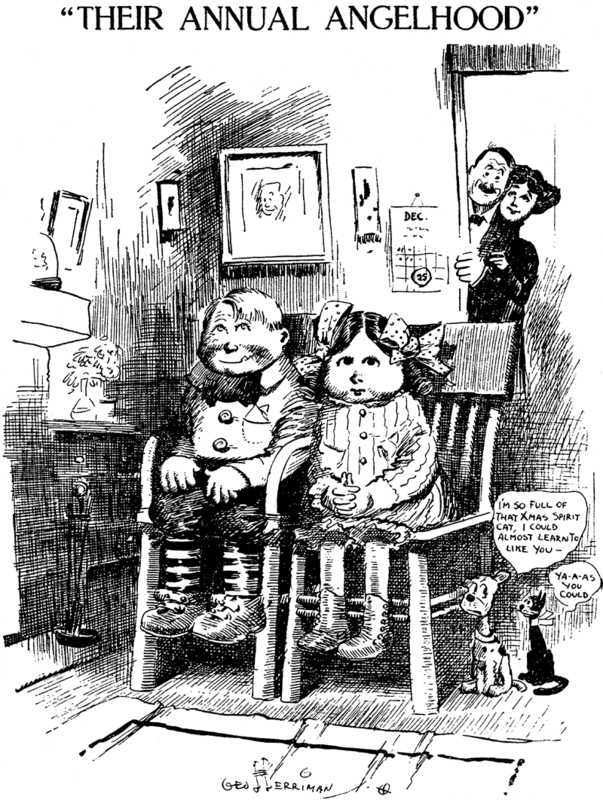 December 21 1908 -- Another Christmas cartoon by Herriman, this one featuring a very early appearance by a Cabbage Patch Kid. Also looks like an early appearance of Krazy Kat. 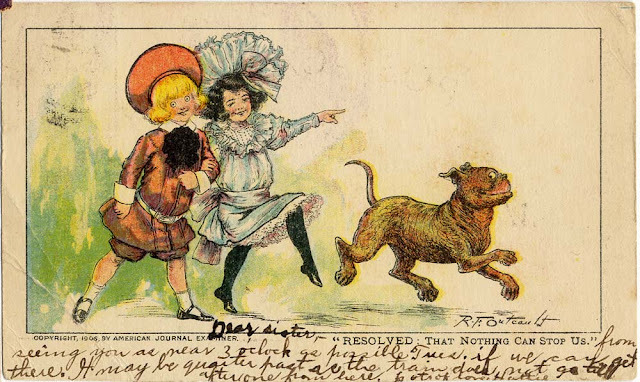 Here's another example of those postcards that were given away by Hearst. This one, which says "Compliments of the Boston Sunday American" on the reverse, was issued in 1906. As was usual with these cards, the cardboard is of quite low quality. However, the iconic image of Buster, Mary Jane and Tige is nonetheless enchanting. I also like that the postcard user so cleverly used the text of the card as part of their message. Nicely done Hattie! Edward Franklin “Ed” Payne was born in Woodstock, Vermont, in May 1870. The birth date is from the 1900 U.S. Federal Census. Payne’s birthplace was mentioned, by the Associated Press, in the Boston Sunday Advertiser, January 9, 1955. However, Payne’s marriage certificate named Bridgewater as his birthplace. Bridgewater and Woodstock are neighboring towns. His parents were Frank Sylvester Payne and Isabella A. Richmond. The 1880 census recorded Payne as the oldest of three brothers. Their father’s occupation was harness making. The family of five resided in Hartford, Vermont. American Newspaper Comics (2012) said Payne produced Billy the Boy Artist from November 5, 1899 to March 6, 1955. The Sunday Advertiser said Payne “created ‘Billy’ at the request of James Morgan, Sunday editor of the Boston Globe, when the newspaper started a Sunday comic supplement. The association continued for 56 years.” Payne created six more series for the Globe; a seventh series resembled Payne’s style but was signed Rube Franklin, possibly a pseudonym. The WPA Guide to Vermont: The Green Mountain State (2013) said Payne had a summer home in West Woodstock. Spirit of the Age, August 6, 1910, said the house was known as Riverest. According to the 1900 census, Payne, his wife and son lived with his in-laws in Cambridge, Massachusetts at 98 Hampshire Street. Payne was an artist who painted. Also in the household was Payne’s younger brother, George F. Payne, a student, who later drew Polly the Cap’n’s Parrot. Payne made his home in Belmont, Massachusetts, at 10 Myrtle Street, as recorded in the 1910 census. His household included his wife, two sons, brother George and a servant. Payne was an artist for a lithographer. The Herald, June 16, 1911, said Payne exhibited originals of Billy the Boy Artist in the magazine and newspaper artists exhibition which included work by N.C. Wyeth and Frank E. Schoonover,. The exhibition was at the new gallery of the Jordan Marsh Company’s new building. Payne’s address was unchanged in the 1920 census. His brother George was not in the household. Payne and his wife were in his oldest son’s household in the 1930 census. Karl was married to Ann and they had a daughter and son. They resided in Arlington, Massachusetts, at 39A Hayes Street. The Herald, May 15, 1931, reported the passing of Payne’s wife. Funeral services for Mrs. Edward F. Payne, who had made her home at the Hotel Bellevue, were held at the home of her son, Karl C. Payne, 49, Lincoln street, Belmont, yesterday. The Rev. Elmer E. Owens officiated. Many attended from the Dickens Fellowship, of which her husband is president, and the Boston Globe, where Mr. Payne is a member of the art department. The body was taken to Woodstock, Vt., for burial. In the 1940 census, Payne lived alone at 82 Chestnut Street, Boston. Payne passed away January 7, 1955, at Copley Hospital, Back Bay, Boston, according to the Sunday Advertiser. He was survived by his brother, George F. of Worcester, and two sons, Karl of California and Edward Jr., of Galesburg, Ill. Payne was laid to rest at Riverside Cemetery. George Forrest Payne was born in Woodstock, Vermont, on April 1, 1878, according to the Vermont Vital Records at Ancestry.com. However, Payne’s World War I draft card had the day as the 22nd. His parents were Frank Sylvester Payne and Isabella A. Richmond. The 1880 U.S. Federal Census recorded Payne as the youngest of three brothers. Their father’s occupation was harness making. The family of five resided in Hartford, Vermont. According to the 1900 census, Payne was a student. His older brother, cartoonist Ed Payne, was married and had a son. The quartet were in the household of William Chatwin, Ed’s father-in-law, in Cambridge, Massachusetts at 98 Hampshire Street. Two months after the census enumeration, Spirit of the Age, August 18, 1900, reported the act by Payne and brother Harold. George F. Payne, son of Mr. and Mrs. F. S. Payne, who was at home last week, with his brother Harold appeared at Keith’s Boston theatre Monday evening and according to the newspapers they made a decided hit with their “poster songs.” This is an amusing novelty originated by the brothers in which a number of large pictures, drawn by Edward F. Payne, another brother, are shown, illustrating popular songs of the day. While a verse of a song is sung by the brothers the picture illustrating it is shown behind a big frame. During the acts George also makes one or two large pictures, using an air brush, while Harold sings, and it closes with a medley during which the pictures are moved rapidly across the stage. The brothers were immediately engaged by the management at Keith’s on seeing a rehearsal of their piece and they will play at all the Keith houses. They then expect to do the entire vaudeville circuit, playing at several places in New York and then going west. Their friends here will be pleased to hear of their success. “A real novelty was shown in the “poster songs” of the Payne brothers, a couple of very good singers, whose unique method of illustrating popular songs caught the fancy of the audience, and scored a solid success. 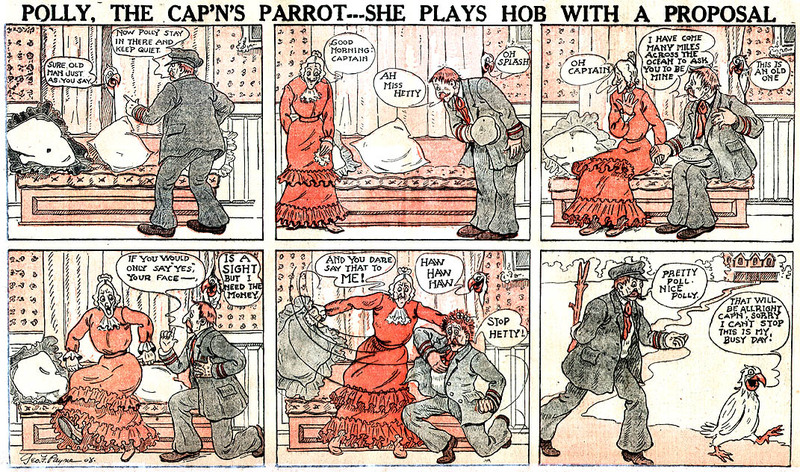 American Newspaper Comics (2012) said Payne drew Polly The Cap’n’s Parrot, from March 29 to May 24, 1908, for the North American Syndicate. 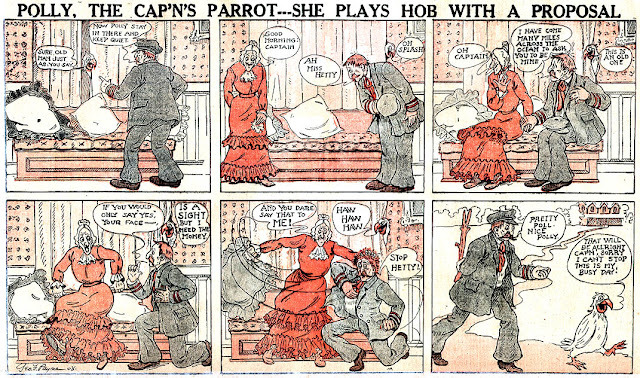 In yesterday’s post, comics authority Cole Johnson noted that the Polly The Cap’n’s Parrot art resembled Ed Payne’s work. Since Payne was living with his brother Ed, it’s safe to say that Payne mimicked Ed’s style. Payne made his home in Belmont, Massachusetts, at 10 Myrtle Street, as recorded in the 1910 census. He was in the household of his brother Ed. Payne was employed as a floor walker at a department store. On September 12, 1918 Payne signed his World War I draft card. He was married to Marguerite and their address was 17 Sudbury Street, Worcester, Massachusetts. Payne was a buyer for Denholm & McKay Company in Worcester. The description of Payne was medium height and build with dark blue eyes and dark brown hair. Payne signed his full name with just one R in his middle name, Forest not Forrest. Payne’s address and occupation were unchanged in the 1920 census. According to the 1930 census, Payne continued as a dry goods store buyer who resided in Worcester. His address was 64 Fruit Street. In the 1940 census, Payne and his wife lived at 5 Dayton Place, Worcester. The same address was on Payne’s World War II draft card and he still worked for Denholm & McKay. Payne’s wife Marguerite passed away in 1947. Payne’s brother Ed passed away January 7, 1955 in Boston. The Boston Sunday Advertiser obituary said Ed was survived by his brother George, who resided in Worcester, and two sons. The date of Payne’s passing is unclear. Find a Grave has a photograph of a grave marker with the years 1878 to 1955. However, the Social Security Death Index has a person named George Payne who was born April 22, 1878 (same date as the World War I draft card) and died in February 1984. An obituary has not been found. Good work finding that Payne had an equally mediocre brother. My brother Cole was usually right when detecting mystery artist's styles. He would also be impressed that Polly is still important enough to be researching, and that he's still currently contributing materially and intellectually to the Guide. "Since Payne was living with his brother Ed, it’s safe to say that Payne mimicked Ed’s style." It MAY also be safe to say that Ed did some major art assisting for his not-quite-as-talented brother George. So maybe the Ed Payne art seen by Cole actually was Ed art. We covered the obscure Philadelphia North American strip Polly The Cap'n's Parrot way back in 2006, when I was a mere 40-something lad and the Earth was still cooling. Awhile after that, my favorite know-it-all, Cole Johnson, pointed out to me that the art on this feature is rather obvious by Ed Payne (he of Billy the Boy Artist fame). As soon as he said that, I could see that he must be right -- those sure are Ed Payne faces alright. So here we are again, forced to read another installment of this awful strip so I can tell you that the signatory on this feature, George F. Payne, is in reality a moonlighting Ed Payne. ... Or is it? Could Cole be wrong? Stay tuned to this channel, folks. Next Alex Jay will weigh in with circumstantial evidence about this Payne-ful case that would make Perry Mason ask for a mistrial! When George McManus first arrived at the New York World, among his earliest efforts was a short-lived series titled The Ready Money Ladies. The concept was as thin as they come: a pair of fashionable and very well-bred ladies compete for the honor of paying for something. It's basically the same idea as Opper's Alphonse and Gaston strip, except it's women, and the subject is always money. The fun comes in as McManus shows us life all around them on hold while the ladies ever so primly debate. He shows us his mastery of both madcap slapstick material and more subtle conceptual humor. 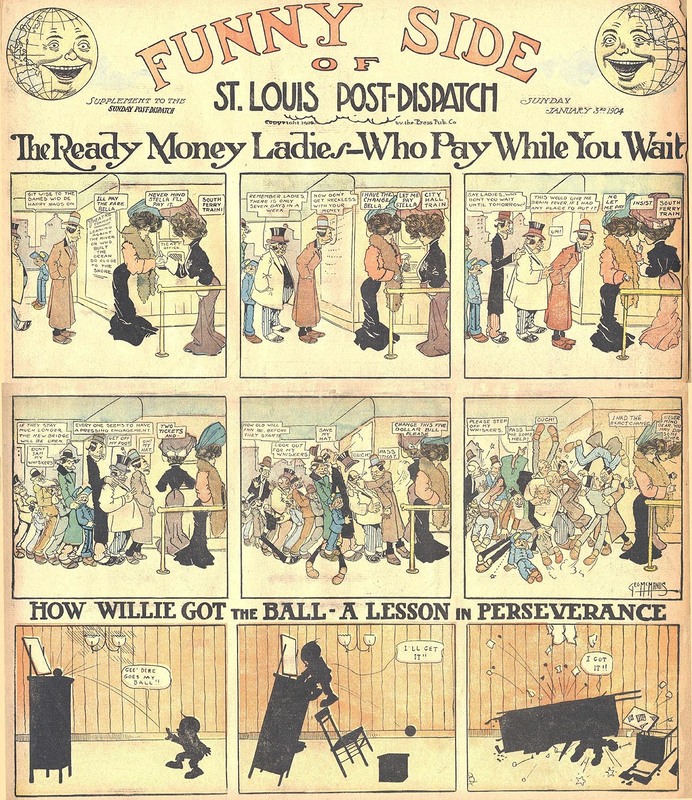 This series, which ran from January 3 to March 6 1904 let New Yorkers know that the World had a new cartooning star-in-the-making. My take on the Ready Money Ladies were a knock off on Carr's Lady Bountiful. If one gullible heiress is funny, the fun will increase exponentially with the ascending number of millionairesses. Also, wasn't this McManus's first Pulitzer and in fact, nationally syndicated work? It's actually tied with "Helpful Hints for Happy Homes" as his first. They both started on January 3.